Home » Tech » New Amazon Kindle 3 Preview – Smaller, Cheaper & A UK-Based Version! New Amazon Kindle 3 Preview – Smaller, Cheaper & A UK-Based Version! Only a few weeks ago we heard news of the new ‘graphite’ Amazon Kindle DX, the latest edition of Amazon’s e-reader device range. Since then, we have also learned that sales of e-books on the Kindle have for the first time exceeded that of hardback sales, which is no mean feat. However, now they have, for the second time, updated the standard Kindle and it’s better than ever! Amazon has stuck with their new-found love for the ‘graphite’ coloured chassis in addition to a white model while making the entire Amazon Kindle 3 device 21% smaller than its predecessor. In addition to that, it’s 15% lighter, all in all, it is a much more portable, and more comfortable device for reading books. They have also maintained their hugely popular 6-inch, e-ink screen, which is one of, if not the best display on an e-reader. However, Amazon has promised a 20% increase in the refresh rate on the latest display screen, which can’t be bad at all. Now on to the more important stuff, the significant changes. For starters, the device will be considerably cheaper than the previous Kindles have been. While in the United States the pricing will be $139 for a WiFi-only version, and the upgrade to 3G only adding $40, there are also plans for a UK version, which will set you back a mere £109 for WiFi only, or £149 for the 3G. By all accounts a hugely competitive price point, which will hopefully, and I think inevitably indicate a general price drop for the entire industry. 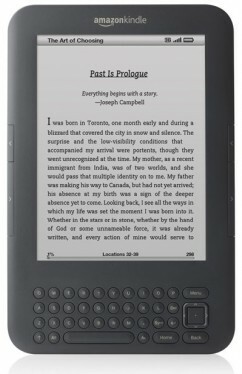 To complement the UK version of the Kindle, there will also be a UK e-book store, so thankfully you will no longer have to make your purchases in US dollars and I’m guessing all UK customers will be much more comfortable buying from Amazon UK rather than have to buy an ‘International Kindle’ from Amazon.com. Other changes include a tweak to the keyboard layout, where you will now find a more condensed set of keys, and the previous navigation controls, which I found irritating and ‘fiddly’, have been replaced by a more convenient almost ‘d-pad’ like control. Apart from that, the circular QWERTY keys are still pretty much the same, with the page turning controls again as they were except a slight change in length. Amazon has also increased the internal storage to a respectable 4GB, meaning even more books to keep you occupied during those autumn and winter months, as the device will begin retailing at the end of August. Plus, another bonus on the new model is the extended battery life over the already impressive endurance of the previous models such as the Kindle 2. Now, the Kindle is said to provide over a month of wireless-free reading and ten days with wireless turned on. Now, Amazon has been under a lot of pressure of late with their range of e-readers, as have other manufacturers of rival devices to include more multimedia content in their devices, especially since the launch of the Apple iPad and the release of Kindle app on the iPhone and Android platforms. So, what do you make of the new Amazon Kindle 3? How does it stack up against the previous models? And if you are currently an owner of said previous editions, would you be tempted to now upgrade given the new features and low price point? Or have you held off from buying so far? Will this new Amazon Kindle and its associated UK-based ebook store finally convince you to get one? Let us know in the comments section below!